Map shows CVRR crossing as Conrail, more modern maps shows this bridge as Cumberland Area Transit Bridge, the old CVRR from Carlisle and this bridge is involved in a proposed commuter rail line scheme. An interesting 1908 postmarked card from Jennie Stout in Waverly PA/NY to Sarah Dudgeon in New Salem, KS shows the second CVRR bridge across the Susquehanna. The scene is from the Harrisburg side looking west towards City Island and the West Shore. 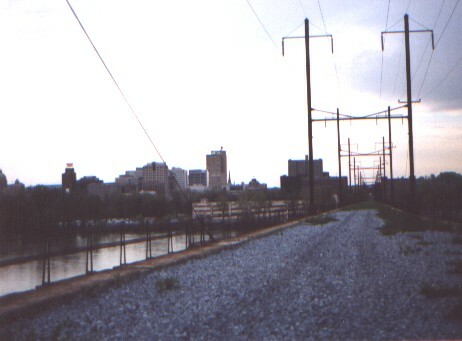 The Camelback bridge is faintly seen in the background. This author's guess is that the photo was taken in the winter and the snow was colored green. Published by J.B. Hoffman, Harrisburg, PA. Dave Cathell collection. 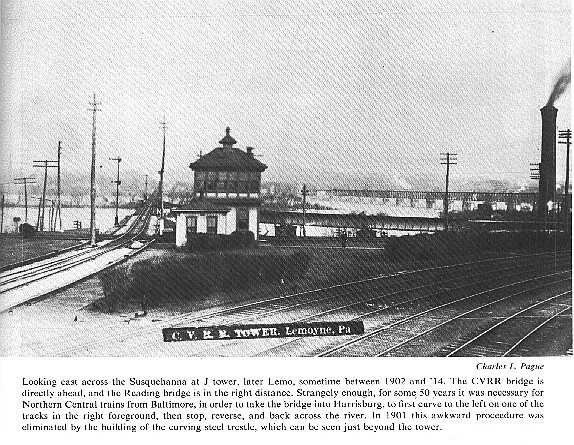 Photo from Westhaeffer's book credit to Charles J. Pague shows Lemoyne at the beginning of the 20th century. Another photo from the book shows that this area included an interchange yard, for exchanging cars with the Northern Central.. The following photos show the bridge and Lemoyne area today. 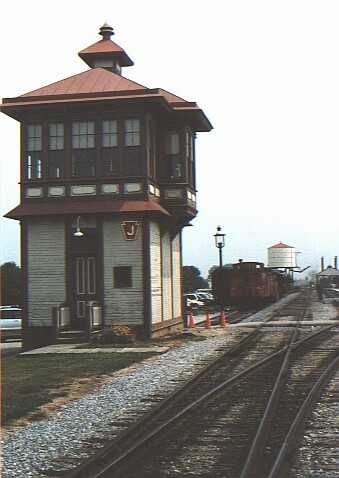 First, here is a photo of J or LEMO Tower that was saved and preserved at Stasburg Rail Road, photo August 4, 2002. Shot from the Washington Heights section of Lemoyne. This town was originally named Bridgeport, a much more descriptive name. 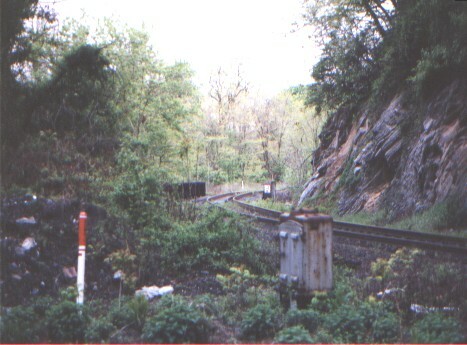 The first bridge in this view is the CVRR and the second bridge in the distance is the Reading bridge, also used by the Western Maryland Railway on the Alphabet Route. Late evening view across the CVRR bridge to Harrisburg. Turning around is the view back towards Lemoyne. 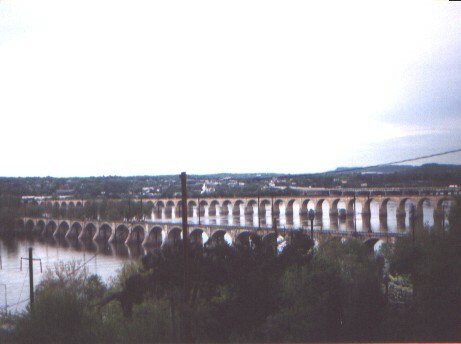 The steel girder bridge is across the Northern Central. 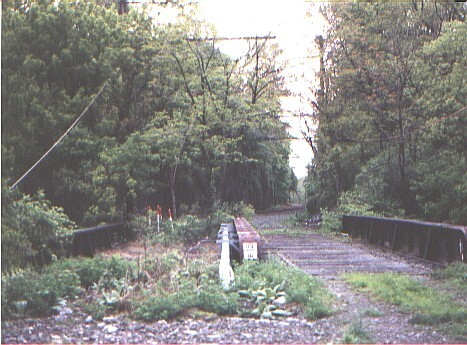 In the area of the Lemo tower, this bridge is to the right and allows traffic from Harrisburg to go north to the Enola yards. 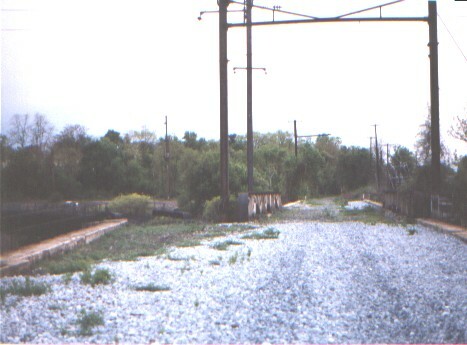 Here is the connection from Enola to the CVRR west bound to Lemoyne. All of the girder bridges in this area are over Market Street which use to be US Rts 11 & 15. This area was very aptly named the Bottleneck. Darkness was fast approaching when this shot was taken eastbound behind Shaull equipement (formerly the West Shore trolley barn), looking down towards the Lemo tower area. This area is referred to in the story below as the River Grade. The action described in the second paragraph below is referred to as "cutting off on the fly". At this time, the CVRR bridge across the Susquehanna was a timber truss affair and heavy weight and vibration were avoided. 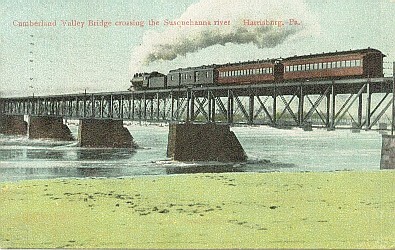 The locomotive cut off and the rest of the train drifted down the grade and across the bridge into Harrisburg. Early on, mule teams pulled freight cars back across the bridge, later a special locomotive with widely spaced driving wheels was used. --As the morning Freight Train was going to Harrisburg, from this place, over the Cumberland Valley Railroad, on Friday morning last, the 16th inst., about 9 o'clock, a sad and melancholy accident occurred which resulted in the death of a much esteemed ci tizen of Chambersburg--Mr. Henry Minnick. The deceased was on the Engine, and, as is the custom, while descending the River grade, went to the back part of the tender to cut loose from the cars so as to run them on to another track than that on which the locomotive is run. 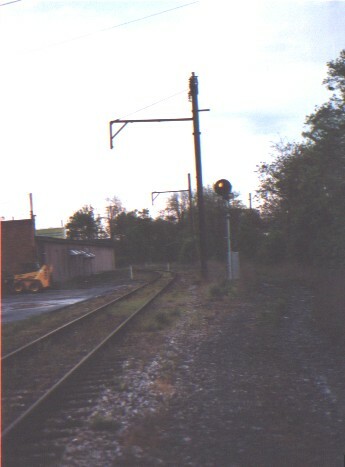 While in the act of unfastening the coupling he lost his balance and fell to the ground, the forward truck of the front burden car passed over his groin crushing him so badly that he died about 1 o'clock in the afternoon of the same day. His wife was telegraphed immediately of the sad news; but, the morning passenger train having gone, she could not leave till 2 P. M., not reaching Bridgeport, on this side of the Susquehana, where he was lying, till 5 o'clock. He was dead before she arriv ed.--He retained his reason till the last. The deceased has been in the employ of the Rail Road Co., for nearly eight years as a fireman on the locomotives run by Mr. William C. Murry, engineer. His habits were most exemplary. Everybody loved him for his many noble qualities of head and heart. He leaves a widow and four small children, as well as a large circle of sorrowing friends to mourn his sad fate. He was 37 years and 2 months old at the time of his death. 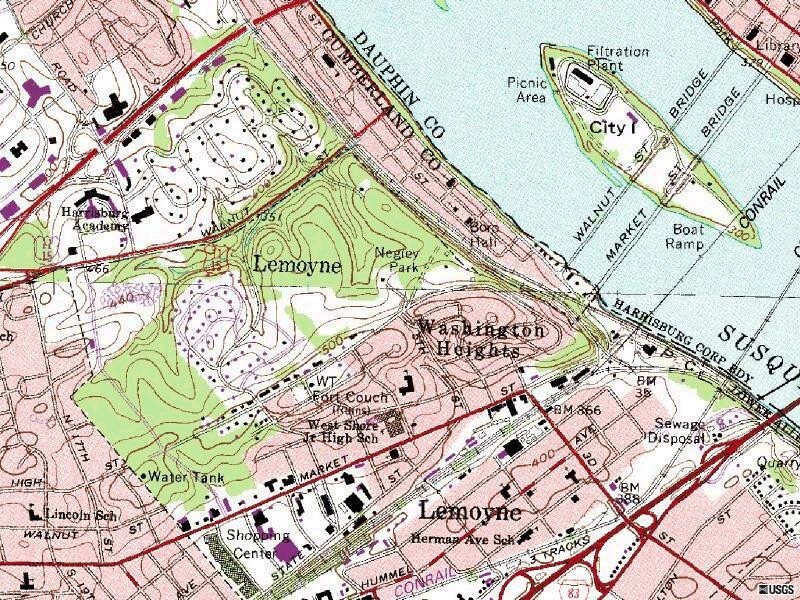 His remains were brought to this place for internment, and on Sabbath afternoon were attended to their last resting place--Cedar Grove Cemetary--by an immense concourse of our citizens. At a meeting of the Engineers and Firemen of the Cumberland Valley Railroad, Company, held at the Office of the Superintendent, at Chambersburg, on Monday Evening, the 19th inst., William C. Murry was called to the Chair and George Wentz appointed Secretary. The Following preamble and resolutions were submitted, and unanimously adopted. Whereas, It has pleased an All-wise Providence, suddenly to remove from our midst our esteemed friend, and companion Henry Minnick, it is fitting that we, his co-laborers, should assemble to pay the last tribute of respect to his memory. Death is at all times gloomy and appalling, but on this occasion it has been rendered double so. Our friend was in the full enjoyment of health and in the vigor of manhood, when in the twinkling of an eye the grim messenger appeared and summoned him hence. The places which knew him on earth will know him no more forever. Resolved, That in the death of Henry Minnick, the Company has lost a faithful and efficient laborer, ever ready and willing to discharge the duties assigned him; we are left to mourn his sudden departure and to bear testimony to his goodness of heart, rendering him at all times a kind friend and pleasant companion. Resolved, That we sincerely sympathize and condole with the widow, family, relations and friends of the deceased in their irreparable loss.